Dr. Florence Jameson, NMC Founding Board Member, Julie Murray, NMC President, and Brian Haynes and Martin Suman from Applied Analysis, provided an overview of NMC and the importance of the NMC Healthcare Report Card at the August 27, 2018 Legislative Committee on Healthcare meeting. 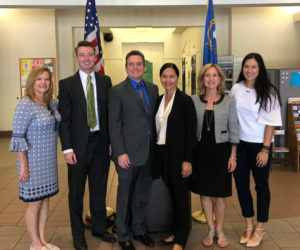 Dr. Jameson highlighted the importance of raising awareness using a collaborative, data-driven approach in order to continue to improve healthcare for all Nevada’s residents. Brian Haynes & Martin Suman shared a high-level overview of the NMC Data Portal which educates and informs NMC’s audiences about the state of healthcare in Nevada.